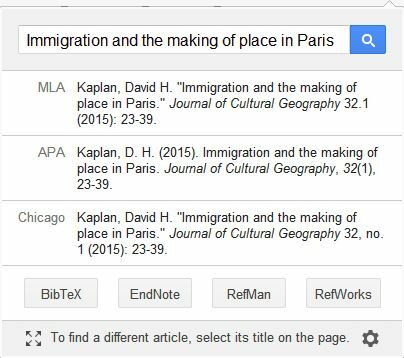 If you use Google Chrome and Google Scholar, you’ll probably be interested in the recently released Scholar Chrome extension. I gave the extension a whirl, and here are my notes – including details of its support for RefWorks and Find My Reference. 1) If you’re on a well-formatted journal article page (which depends on the publisher doing a good job), the extension will pick up the article details automatically. 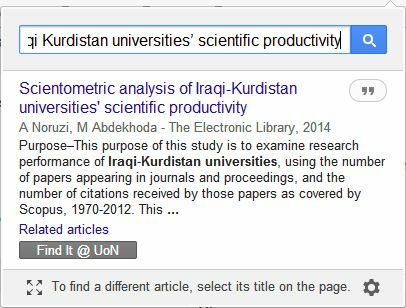 2) If you’ve highlighted an article title on any web page, the extension will search Scholar for that title. 3) If you’re not on an article page and nothing has been highlighted, you’ll see a Scholar search box. If the extension finds a matching article you’ll see basic information, which links through to Google’s source for the article (usually the publisher’s page). If no exact match is found, you’ll see the top three Scholar results. 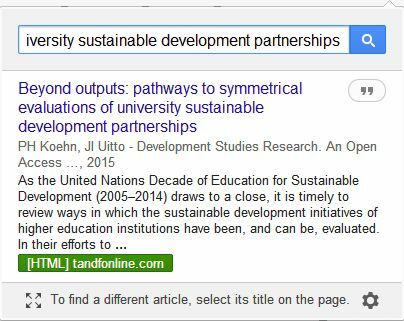 The four arrows in the bottom left open the full Google Scholar results in a new tab – useful if you haven’t had an exact match and want to see more results. If you’re especially lucky, you might see both buttons. While you’re in the settings, you can use the Library Links section to add University of Northampton as a permanent library connection. This means you’ll see the Find It @ UoN button in Scholar even when you’re off campus. Just click Library Links, type Northampton into the box and hit return, and Find It should appear ticked underneath. Click Save and you’re done. Ultimately, this extension is simply offering a convenient shortcut to Scholar results and features. It doesn’t offer anything that isn’t already part of Scholar, but it’s fast and always on hand. If you’re using Chrome and Scholar regularly, you’ll probably find it very helpful. If you’re a RefWorks user, you may find it useful as a quick means of getting data into your RefWorks library. I recommend giving it a try. Posted on April 14, 2015, in Library and tagged Google, Google Scholar, journals, refworks, scholar, web tools. Bookmark the permalink. 3 Comments. Reblogged this on Tech Blog | Internet Tools & web development tutorials & Tips | Celebrity news | Photoshoots | Codding | WordPress | Online Game | Script | Themes.